A photo from court records shows CRT glass stored outside Stone Castle Recycling’s Clearfield, Utah facility. Anthony L. Stoddard, who owned Utah-based Stone Castle Recycling, was sentenced to 12 months and one day in prison and three years of supervised release. Restitution has yet to be determined. He was sentenced on Jan. 28 in U.S. District Court for the District of Utah, Northern Division. The judge ordered Stoddard to self-report to prison on March 1. 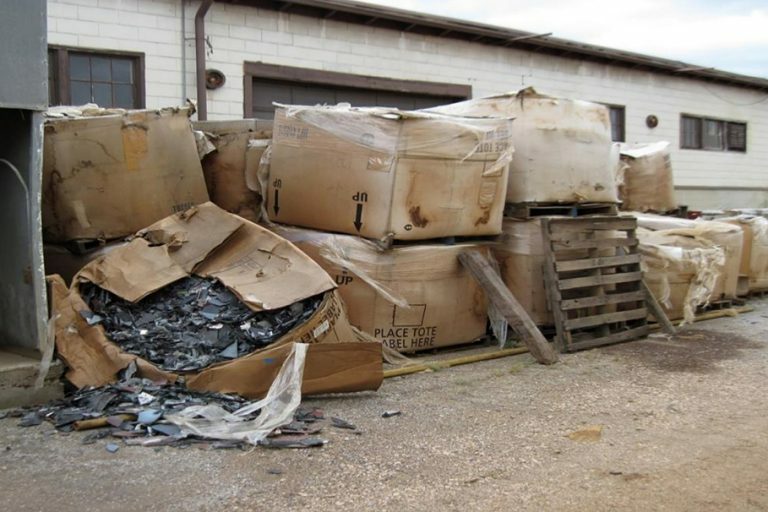 Stone Castle Recycling, which handled CRTs and other e-scrap materials, first drew scrutiny from environmental regulators over CRT storage practices in 2013. Stone Castle had three locations in Utah – in Cedar City, Clearfield and Parowan – and fires broke out in 2014 at the Cedar City and Parowan sites. Prosecutors said the company also mislabeled hazardous CRT glass and sent it to a landfill not authorized to accept hazardous waste. The Basel Action Network (BAN) in 2014 issued a report criticizing the company and alleging it was involved with exporting material to Hong Kong.